We are pleased to announce another great feature on your GeoGebra profile page! You can now ‘Follow’ your favorite people in the GeoGebra community and get updates whenever they publish new materials. The new tab ‘Following’ lists all your Followers, as well as all people you are following, giving you easy access to their profile pages and public materials. As soon as other users start following you, you will receive a cool ‘Followers badge’ on your profile page as well, counting the number of your Followers. Please help us to spread the news, simply by signing in to your GeoGebra account and going to tab ‘Following’ on your profile page. There, you may search for other users you think create great materials in the GeoGebra community and ‘Follow’ them to keep up-to-date with their newest contributions! More new features coming soon! Share your ideas and feedback on our Help page. 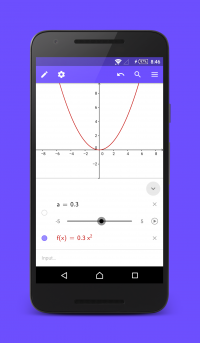 The new GeoGebra Exam App allows you and your students to use the power of GeoGebra during exams alongside paper and pencil (ie like a graphing calculator) while restricting their access to the Internet and other software on their computers that should not be used during the exam. If a student leaves the GeoGebra Exam window (eg by opening another browser tab), the top header of GeoGebra Exam turns red immediately. An information button shows the Exam Log with detailed information when that happened and for how long. For more details on how to best use the GeoGebra Exam App during tests and exams, please see our GeoGebra Exam Tutorial. We plan to include the Exam Mode in our offline apps (Chrome, tablet, phone) as well soon. For now, please give it a try and let us know any ideas for improvements at support@geogebra.org, thanks! We’re pleased to announce the first public release of our GeoGebra Graphing Calculator! It’s for Android phones and tablets right now, iPhone and Windows will follow, watch this space! For the first release it has the graphics and algebra views but we will be adding lots more features over the coming months. We have prepared the foundations so everything necessary is already working under-the-hood (for example the CAS engine, and you can create – but not yet display – 3D objects). You can download it in the Play Store now for Android phones and tablets – please let us know your ideas for improvements with the “Send Feedback” option or in our Mobile Apps forum. 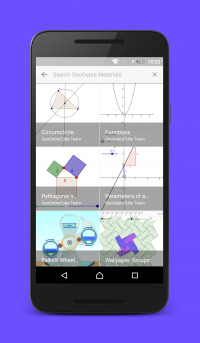 The GeoGebra community is all about creating and sharing great materials for learning math & science. Thanks to you, we now have more than 300,000 free and interactive worksheets and books. Supercool and easy collaboration between students and teachers, colleagues, and really just everyone nice out there! Try out our Groups, start to collaborate in a new way, and let us know what you think! 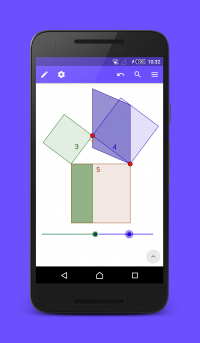 We’re pleased to announce the first public beta-release of GeoGebra for Android Phones. We’ve already started on an iPhone app, watch this space! For the first release it will have just the Graphics View and Algebra View but we will be adding lots more features over the coming months. We have prepared the foundations already so everything necessary is already working under-the-hood (for example the CAS engine, and you can create – but not yet display – 3D objects). You can download it in the Play Store now (for Android phones and tablets!) – please let us know what you think with the “Send Feedback” option. So we got together with a few amazing members of our community, one really awesome partner, and then turned the cameras ON. With a little fancy footwork, cutting, pasting… Voila! This summer, GeoGebra was again part of Google Summer of Code (GSoC) supporting young and talented open source coders. We had a very strong field of 64 students applying and were able to choose 4 of them to work with us during this summer. There were also some impressive contributions submitted by many of the other candidates which have already been incorporated into GeoGebra. Our current iPad app is based on a WebView so we were interested to see if Jacky could make a prototype of a native app using the quite-new RoboVM cross-compiler to convert GeoGebra’s Java code into Objective C. As part of his application he managed to get the JLaTeXMath formula engine working which was very impressive in its own right. For the first half of his project he got the full GeoGebra kernel compiled and running and for the second half he worked on drawing objects and user-interaction. There is still a lot to do before we can make a release (for example implementing the toolbar and equation editor) but Jacky will stay on with GeoGebra after GSoC to help! Polygon Intersections in 2D and 3D! As part of Thilina’s application, he adapted the Clipper library to compile with Java 6 and with GWT and incorporated it into GeoGebra, which he then used as part of his main GSOC project to improve the polygon operations within GeoGebra. He has also done a lot of work on improving the Intersect command to allow the intersection of many more object types to be calculated dynamically. Thanks to all our GSoC students for a great job done during this summer! We’ve made a major change to GeoGebraTube and our Chrome App. We have updated the formula renderer (otherwise known as LaTeX renderer) to use the same version as in the desktop version. 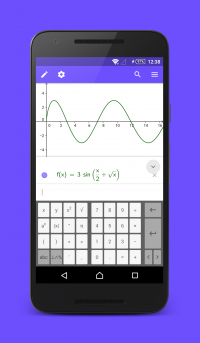 This means that mathematical formulas in our applets and web application will now look just as beautiful as they do in GeoGebra’s desktop version. This will work with all existing formula commands as well (for example TableText, FormulaText, FractionText, StemPlot). We are happy to inform you that the official registration and abstract submission for the GeoGebra Global Gathering Conference are now open. Join us at our GeoGebra Global Gathering (G3, 2015) July 15 – 17 in Linz in Austria and register now! Because there is only a limited number of participants we can host, we highly recommend to register for our gathering as soon as possible to make sure you can join us this July. Please find more information about all the practicalities in our G3 2015 GeoGebraBook. We are looking forward to seeing you this summer in Linz!